Max got the serial casts on Friday. It took about an hour, and he was calm the entire time. (Thank you, DVD player and Cars movie.) 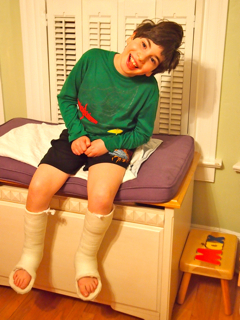 I was so worried about how he'd get around with casts on both feet. He's a little wobbly, as you might expect when you're walking around with a couple of extra pounds glommed onto each leg, but it didn't stop him. Max was as happy and intrepid as ever. As it turns out, the so-called "shoes" are the real trouble. It took us about eleventy billion hours to get a pair of Dave's socks on over the casts, or maybe it was ten minutes, and then once we Velcroed the "shoes" on, Max couldn't get a lot of traction and walking wasn't as easy. We may have to send him to school with open toes, perhaps Max could set a new trend in footwear. 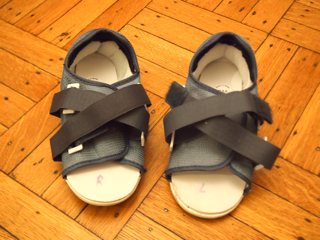 My friend Wendy says that someone could make a killing if they invented actual shoes that fit over the casts. Heads up, Prada! Max is still deciding what he wants me to write on the casts—it's either going to be "Max loves Cars 2" or "Max loves mac 'n cheese with ketchup" or both. Tough decisions like this take time. I knew the casts didn't hurt but at bedtime last night, I asked anyway. "Nooooo," said Max. And then he gestured toward one foot, then pointed to the other and said "Nooooo." I knew exactly what he was saying. "You want to have a cast just on one foot, right?" I said. "Essss," he told me. And I hugged him tight and tried not to get upset and made myself think, This is good for him. This is good for him. But it was definitely one of those times when I hated the cerebral palsy. Max wears two long blue plastic sleeves at bath time to keep water out. Thursday night, we have to take them both off; basically, you just unravel them. Sabrina actually did the job two years ago, the last time he had one, and we might ask her to do it again—assuming she still charges reasonable rates. Max is supposed to wear the casts for six weeks but there's a good chance the left one may come off a couple of weeks before the right one. His grand prize: a new night cast in purple. Maybe try going for a pair of warm socks and Birkenstock type sandals to cover his feet? The rubber bottoms would give much better traction than the weird foam bottom on the "shoes" they give you for a cast.-Prof.Mommie. He doesn't have sandals like that but as a last resort, we might have to buy some! I checked in with the head of the casting dept today for advice. Thank you, Prof! Max's fuel is high-octane determination and willpower! Oh, yes, that scene last night was haunting me today... I wish it could only be one cast. I wish it could be NO casts. Thanks for that virtual hug. Oh-- I so get how big a pain in the neck casts are, now that I have one on my right hand for six weeks. Max's request for only one made my heart hurt. Perhaps you can let Max know that I chose amazing purple for my fiberglass cast. I think I'll call it the Max cast. Take care! He would be honored if you named your purple fiberglass cast the Max cast. I hope you are healing well!!! What about trying those fuzy socks with grippers on the bottom? Could he wear socks indoors at school? Listen, he could come to school in nothing but boxers and they'd be all "Oh, that's fine" if it was something that could enable him! Er, not that anything like that would happen. Fuzzy socks are a good option if I can't figure out a sturdier shoe solution! Thanks, Jill. Max the trendsetter! Maybe he might be a shoe designer. Well, that would be fabulous because I have an extremely boring flats habit and could use a style muse who happens to be related to me! We bought really big socks to go over the casts after getting very frustrated with trying to shove the casts into other socks. It's definitely trickier when casting is happening in the winter. I know it's a huge hassle and I cringe every time it is suggested again for my son, but it seems like Max had great results with it last time and it's nice to know there is a non-surgical way to help sometimes. That is exactly what's keeping me going: That it's going to be good for him. And yes, more good perspective, at least it's non-surgical. Ah. You know, this would be far easier than trying to shove them over the entire cast. Plus I am betting I can find some purple duct tape. (It is a little unnerving how I view life through purple-colored glasses.) Gina to the rescue! You always have such creative solutions to everything. You and Max are both troopers! Moms and dads need lots of courage as you ride the roller coaster of life. I've been on the ride for 20 years and I understand how you feel. Keep up the courage and your spirits! Thanks! Pinot Grigio helps too!